Virtual reality just isn’t as exciting as it once was. I wanted to use technology to allow people to interact with the real world, so I’ve created a way to experience Remote Reality through Orbduino. 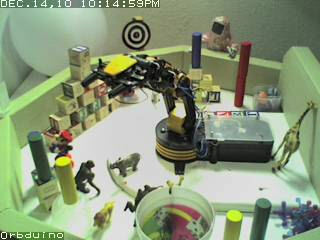 Orbduino allows the user to interact with objects over the web. No matter where you are in the world, you’re making real stuff happen in another place. Sure, it’s just small stuff- but still pretty cool, huh? How to play: Use the buttons below to interact with the different objects. • If you have control but don’t see movement after clicking, you may be at the limit of where you can go. Try moving back the other way. Give me a surprise the next time I check it out. I'll try to throw new things into the mix on occasion and put forth some challenges to keep things interesting. I'm always looking for input for improvements or new ideas! You can post on the Facebook page, Send e-mail, or leave a message below. Press and hold the Target to see something special. It's not easy, and you can't do it with the arm alone. Good Luck! If you do press it, leave me a note in the chat above with your nickname and location. 11/22/2014: After 4.5 years continually on-line, the Orbduino will be taking an extended hiatus beginning 11/29/2014. This was a difficult decision, but necessary due to space constraints. Hoping the Orbduino will return at some point in the future, but am unable to say when at this point. Thank you all for your patronage over the years!